An Interval Tree is an ordered data structure whose nodes represent the intervals and are therefore characterized by a start value and an end value. A typical application example is when we have a number of available intervals and another set of query intervals, for which we want to verify the overlap with the given intervals. The Interval Tree structure comes into play to provide a more efficient solution than the naive approach of applying a brutal force strategy and compare each query range with all the others and check if, according to the values of the relative bounds, there is an overlap (total or partial) between them. 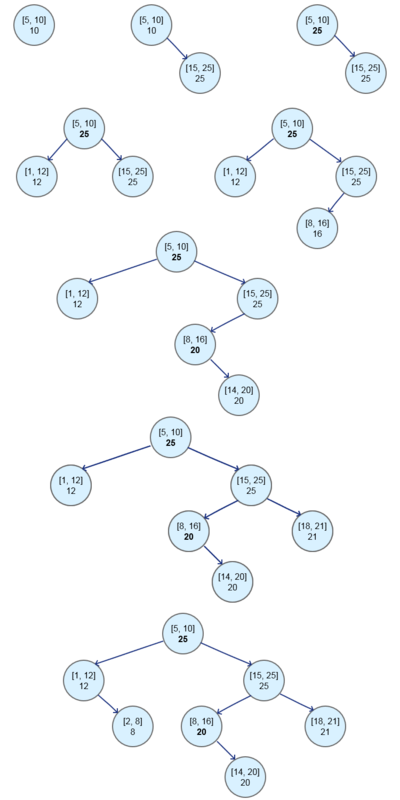 In particular, to make more efficient this type of search we can use an Augmented Interval Tree, a structure in which the information contained in each node is increased by adding, in addition to the bounds of the range, also the information related to the maximum value of the subtree of the node that we are analyzing. This value must be calculated during the insertion phase of each node and it need to be updated, backward to the top, in case of deletion of a node. Let’s see an example in which we create the Augmented Interval Tree related to the previously described nodes; each node contains information of its bounds, in the format [5,10] and, below, the information on the maximum value of its sub-tree. Let us analyze the insertion sequence: starting from the root node [5,0] is then added the second node whose bounds are the values 15 and 25. In this case we must immediately proceed with the update of the additional information about the maximum value of the subtree for the first node (third picture in the top right). The second node has, in fact, as the maximum extreme 25 and then this value must be reported in the first node (being the second node in its the subtree). Proceeding, nodes with the intervals [1,12] and [8,16] are inserted and both do not require updates to the maximum value of the other nodes. 16 in fact, is not greater than the maximum value of any of the nodes we went through (25 for both). At this point we insert the node for the interval [14,20]. In this case, the node ends in the subtree of [8,16] and that node has exactly 16 as maximum value. Since the upper bound 20 is larger than 16, we have to update in the node [8,16] the information about the maximum value of the subtree, passing just from 16 to 20. Finally we insert nodes for the last two intervals, [18,21] and [2,8] which however do not require the update of anyone of the nodes that pass through, because their upper values do not exceed the maximum value of the subtree in which they end up. Now let’s start to implement the class that represents the nodes, which will then contain the bounds of the ranges, the maximum upper limit of the subtree and the references to the child nodes, the right and the left. In this class, that we call Interval, we implement the Comparable interface and then redefine the compareTo() method, as we have to establish a criterion to compare the nodes and then determine the insertion position in the tree. In addition we also provide a override of the toString() method that provide us a readable representation of our nodes, showing the extremes of the ranges and the additional information of the maximum value of the node subtree. return "[" + this.getStart() + ", " + this.getEnd() + ", "
For the insertion of the nodes we create a recursive method that runs through the tree until it finds the correct point in which the node has to be inserted and it also updates, when needed, the additional information about the maximum value of the subtree of the various nodes. For the tree printing, as we are interested in checking if the nodes have been inserted correctly according to the value of the range they contain and the maximum value of their subtree, we use the classical recursive algorithm for ordered traversal of a binary tree: In-Order Tree Traversal. As we can see, this result coincides with what we expected. At this point we can proceed with the implementation of the functionality for which we turned in this type of data structure, that is the verification of the overlap between our given intervals and a list of query intervals. For this purpose, we define a new method that, for each query interval, it traverses the tree and adds the intervals with whom it overlaps to a list. In making the search for nodes within the Augmented Interval Tree we will use the information we have added, relative to the maximum value of the upper bound found in the subtree of each node, to maximize the search performance and exclude unnecessary comparisons. The way we use it is the following: if the maximum value of the subtree of the left child of a node is lower than the starting point of the query range, then we can exclude from the comparison all the nodes in the entire subtree and go directly to the right subtree of the node. As we can see, once again, the result is exactly what we expected. Referring again to the tree structure shown in Picture 2, we can notice that after comparing the query interval with the root, the algorithm checks if the maximum upper value of the left child of the root itself (12) is greater than the lower bound of the query interval (20). In this case it is not, and this means that in the left subtree of the root there are no nodes representing intervals that may overlap with the query interval, so it excludes the entire left subtree from comparisons and it goes directly at analyzing the nodes of the right subtree of the root. Thank you! I’m really happy you appreciated the article. I agree. Brilliant. Thanks for the post. Thanks for the post, really helped me u/stand interval tree. why didnt u cover the deletion part, like everyone skips.